Thank God I have this blog to vent my feelings and spazz. I can’t contain all my feels I’m feeling right now so what’s a better way than to express it all through here?! This is exactly why I created a blog. Lol. So we all know that JYP is going to debut their new boy group GOT7 and all seven members have finally been revealed. First of all, AENFKDPA;FNAKLNK;LANFEKLWANFEK;FNI303293289FKENMALFNAKFNDK. I mean honestly, I’m not even a JYP stan or a fan of any of JYP’s groups. I used to be a big fan of Wonder Girls and 2PM back then, but my love for them has unfortunately expired and I don’t care too much about JYP anymore. But then they’re planning to debut a new boy group called GOT7 who consists of JJ Project’s JB and JR, trainees Mark, Bam Bam, Jackson, and Yugyeom who all amazed us on WIN: Who is Next, and newcomer Youngjae who apparently only trained for 7 months [even shorter than Baekhyun and Chen’s training! WUT]. Anyways, after seeing all of the teaser photos, I am so damn excited. I can’t even tell you how I feel right now. I mean honestly, I didn’t care too much for JJ Project (although I did think JR and JB were mighhttttyyy fiiinnneeee). But I’m especially looking forward to this group because of Mark who I have a huge crush on after watching him on WIN: Who Is Next [I even followed him on Instagram. OH YEAH! Biased much? Lol.]. Jackson didn’t really make a huge first impression on me, but I did like his nickname J-Flawless and his rapping [guy is good]. As for Bam Bam and Yugyeom, I never really cared for them when I saw them in WIN:Who Is Next, but Bam Bam is SO FREAKING CUTE in his teaser photos orz. I MEAN LOOK AT THIS CUTIE. 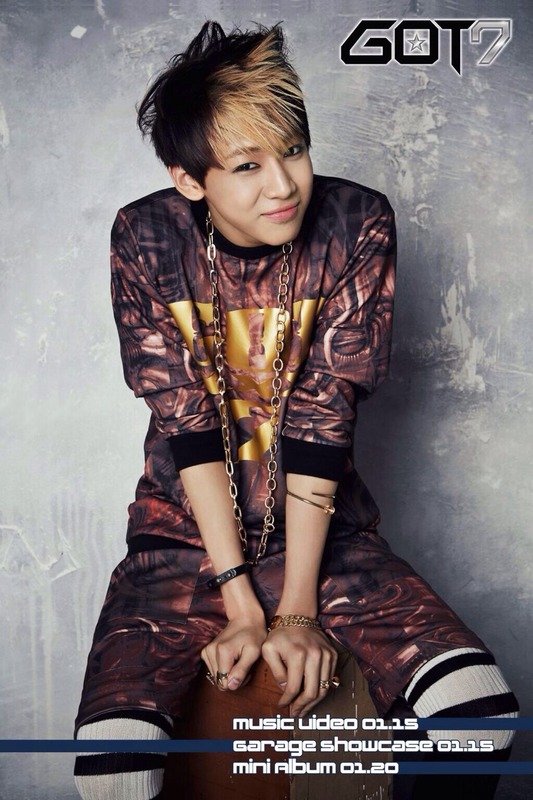 and who knows – maybe after their debut, I might start liking Bam Bam and Yugyeom. Now as for Youngjae, I’m glad that there’s another 96-liner ready to debut. And the cool thing is – our birthdays are in September! His birthday is 12 days before mine and I’m just so happy (I don’t think having the same birthday month is something crazy to spazz over but idc). Mark’s birthday is also in September [September 4th to be exact]. Then JR’s birthday is on September 22, an exact week before mines. HOLY COW. All these birthdays in September [kind of feel bad for the fan club / members who’s going to have to spend extra extra extra money for all 3 members since they all have close birthdays to each other, lol]. Anyways, like I was saying, I’m pretty excited for their debut and what they have to offer. The fact that they’re going to be an acrobatic group kind of reminds me of 2PM in a way, because 2PM was involved with acrobatics as well when they first debuted and the teaser photos sort of remind me of 2PM as well, but I hope JYP does a better job at managing GOT7 and really step their game up. These guys are talented and handsome as hell, JYP better know what they’re doing with them. That’s all I gotta say. But I really hope GOT7 brings something new and fresh to the table. I’m anticipating their debut! GOT7 will be releasing their music video and ‘Garage Showcase’ on January 15 followed by their mini-album which will be released on the 20th of January. SO WHO ELSE IS EXCITED?! Just me? okay.